Α standoff between the Greek Government and the Canadian mining company Eldorado Gold ended on Wednesday, when the Minister of Energy, George Stathakis pledged to grant the pending permits that had prevented the company’s investment from going forward. Eldorado Gold had threatened on Monday to suspend all operation in Greece, due to the delays in acquiring routine permits, as well as lack of clarity on an upcoming arbitration process. The decision caused a stir in Greece, coming a day after PM Alexis Tsipras expressed his governments commitment to bring foreign investment to the country. Considered to be the largest foreign investor in Greece, Eldorado (a company targeting copper, gold, lead, silver and zinc) acquired the mines of Kassandra, in Halkidiki for $2 billion in 2012 an has invested an additional $1 billion, according to its CEO George Burns, who made a statement saying that the company will not go forward with its planned new investments into its Olympias and Skouries projects and the Stratoni mine, unless it receives relevant permits. This statement was seen as an ultimatum, creating a chain reaction in Greek politics. The opposition accused the government of failing not only to attract new investors but to retain those already operating in the country. Seeking to diffuse tension, and thaw relations with the company, Energy Minister George Stathakis came out saying that licensing for the Olympias project would be concluded immediately, with the other two to follow soon, while arbitration is processing according to schedule. The Minister’s announcement came after dozens of Eldorado Gold employers protested outside the ministry, expressing their concern about losing their jobs; they were met by police firing tear gas at them. Eldorado claims to employ about 2,000 workers and promises to hire more for the new projects. Debate over the investment has been focusing on employment, however the mines have been the target of fierce and ongoing opposition by locals, who are concerned that the mines will ruin a landscape of pristine beaches and lush forests and destroy the region’s tourist riches. Halkidiki is one of the most popular tourist destination in Greece. Governing party, SYRIZA had been one of the main opponents to the investment, before coming to power in 2015, but has since changed stance, and supports the invesment, as long as it complies with environmental restrictions and is economically sound. The Energy Miniser’s decision to grant the Olympia permit was welcomed as “a positive step forward” by Mr Burns, who said that Eldorado is still waiting on permits for its other two projects. However, the pending permits are blocked for environmental reasons. 60 percent of the Skouries project has already been licensed, with the rest depending on the arbitration process, which will rule over the mining method. 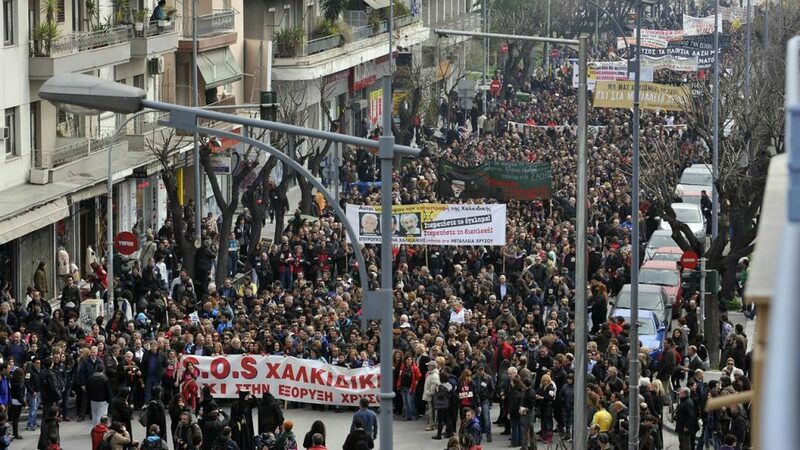 The court’s decision will be crucial for the construcion of a smelter in Skouries. The flash smelting method, proposed by Eldorado, was not in the initial contract and is considered to be unsuitable for the Halkidiki project, given that it will release 20,000 tons of arsenic in the air annually, well above accepted levels, which is the reason behind the local community’s ongoing campaign against the project. According to the ‘Press Project’, Eldorado Gold’s proposition is based on modelling made for Finland; the miner has yet to produce an alternative, or to prove the suggested method’s viability. If the smelter is not built, then the company will have to outsource this part of the procedure, which means that gold will not be actually produced in Greece, thus lowering the estimated income.